2379. On Jason W. Moore's "Capitalism in the Web of Life"
Jason W. Moore’s Capitalism in the Web of Life: Ecology and the Accumulation of Capital (2015) offers a new perspective on capitalism and its current systemic crisis by developing an ecologically centered theory of capital accumulation. This essay first presents a concise account of Moore’s theory. (see, endnote 1) Then, I turn my attention to Moore’s methodology which he believes is “revitalizing” and “reworking” Marx’s and Engels’ historical materialism. In section 2 and 3, I examine this claim and find it wanting. In fact as I will show Moore's methodology and theory are entirely different from those of Marx and Engels. The fact that Moore’s methodology and theory are different from Marx does not mean that they are “wrong” or lack explanatory power. In section 4, I examine the inner logic of Moore’s methodology and theory and find them incoherent on their own basis. In Section 5, I outline a way forward that shares Moore’s concern with situating humanity in nature and shares with Ecological Marxism of Foster and others their focus on the concepts of metabolic rift and alienation from nature. “those extra-economic processes that identify, secure, and channel unpaid work outside the commodity system into the circuit of capital. ... So important is the appropriation of unpaid work that the rising rate of exploitation depends upon the fruits of appropriation derived from Cheap Natures, understood primarily as the ‘Four Cheaps’ of labor power, food, energy, and raw materials.” (p. 17, emphasis added). “Capital must not only ceaselessly accumulate and revolutionize commodity production; it must ceaselessly search for, and find ways to produce, Cheap Natures; a rising stream of low-cost food, labor-power, energy, and raw materials.... These are the Four Cheaps...The law of value in capitalism is a law of Cheap Nature.” (p. 53, my emphasis). Moore argues that “Foster’s original formulation of metabolic rift opens the possibility for thinking through a singular metabolism of power, nature, and capital.”(endnote 3) He enumerates three “registers” in Foster’s formulation of the “rift.” First, there is a “rift between human production and its natural conditions.” Second, there is a “material estrangement [alienation] of human beings in capitalist society from conditions of their existence.” Finally, the rift finds geographical expression in a new town-country antagonism. All living organisms “appropriate” from their environment their means of subsistence in order to live and to reproduce. For 190,000 years or 95% of our existence, modern humans lived as hunter-gatherers who – like other animals – appropriated their livelihood. When a combination of factors forced some hunter-gatherer bands to take up farming about 12,000 years ago, production for subsistence began. First farmers “begin to distinguish themselves from animals as soon as they begin to produce their means of subsistence, a step which is conditioned by their physical organization…” (ibid., p. 31, emphasis in original) (endnote 6). (In thinking through Marx’s concept of metabolic rift this is an insightful passage to which I will return in Section 5 below). It is important to note topics Marx and Engels quite explicitly set aside: “Of course, we cannot here go either into the actual physical nature of man, or into the natural conditions in which man finds himself—geographical, oro-hydrographical, climate and so on.” (ibid. p. 31) The point is that they were fully aware that “human nature,” and our natural context, environment and what is now called ecological niche matter and can be woven into their analysis. But they still insisted that a focus on “mode of production” is the proper methodological focus for historical studies. The contrast with Moore is considerable. Following Wallerstein who identified capitalism with “production for sale in a market which the objective is to realize a profit” (Wallerstein, 1974, p. 398), Moore holds that capitalism came into existence in the long sixteenth century (1460-1650). (endnote 7) For Marx capitalism in England took at least a century more to emerge. Moore does not distinguish between “capitalism” and “capitalist mode of production.” For Marx, the former is a social formation and the latter a historical mode of production. A nation-state typically is a social formation including a number of modes of production. A nation-state is called capitalist when the capitalist mode of production is dominant. This requires the formation of the general (average ) rate of profit. (Marx, 1894, Part Two; also see, Shaikh, 2016, Pat II, especially, 7. IV) To my knowledge neither Wallerstein nor Moore have argued that this was the case in the long sixteenth century. Moore’s revisions to Marx’s and Engels’ historical materialism are extensive. First, he insists that capitalism is “not an economic system ... not a social system; it is a way of organizing nature.” A charitable interpretation of this assertion is that for Moore capitalism is first and foremost “a way of organizing nature.” But in doing so, Moore is focusing attention on what is shared with all other modes of production, the exact opposite of Marx’s method that focused attention on what is unique to capitalist production. Second, in his theory of accumulation, Moore de-emphasizes capitalist production, hence wage-labor, and emphasizes appropriation of “unpaid human and extra-human nature.” That is, Moore privileges “appropriation” instead of “production.” Third, he sets aside Marx’s labor theory of value, his historical materialism applied to the analysis of the capitalist mode of production, in favor of a “law of value” that combines “work/energy” from appropriation and surplus value from capitalist production to explain the history of the capitalist system and its crisis. Moore’s methodology and theory have serious internal tensions. Moore himself acknowledges some of them. For instance, he admits that his proposed EROCI ratio (energy returned on capital invested) to measure “world ecological surplus” cannot be operationalized: “This is an imperfect formulation, precisely because the condition for quantification within the commodity system (units of labor-time) is a world of unpaid work that cannot be quantified.” (P. 96, footnote 16) However, Moore does not seem to recognize that this same lack of congruency and incoherence runs through his entire theory of capitalist accumulation which centrally depends on appropriation of “unpaid work by human and extra-human nature.” If Moore cannot quantify unpaid work, then how can we assess how central its contribution is to capitalist accumulation? The same methodological problem crops up in Moore’s notion that capitalism is “co-produced by human and extra-human nature” (e.g., see, p. 14). If appropriated unpaid work is centrally important to capitalist accumulation and by appropriation we understand the dictionary definition (“The action of taking something for one's own use, typically without the owner's permission”) then how can we view those who have been subjected to appropriation as “co-producers?” In 2011, more than 58 billion chickens, nearly 3 billion ducks, and some 1.38 billion pigs were slaughtered worldwide to be sold as food. Other farm animals slaughtered for food numbered in the hundreds of millions (turkeys, geese and guinea fowl, sheep, goats and cattle). (Heinrich Böll Foundation, 2014, p. 15; for a discussion of this, see, Nayeri, 2014) It is clear that the meat industry quite consciously “worked through” nature by enslaving, torturing and mass murdering these billions of non-human animals. Should we call their victims “co-producers” of the capitalist meat industry? To what end? Ecological Marxists like Foster identify alienation, in particular alienation from nature, as the ultimate cause of the ecological crisis. In this, they follow Marx’s labor theory of alienation, closely tied to the rise and dominance of the capitalist mode of production. However, we know of many pre-capitalist civilizations that collapsed in part because of ecological crisis. Clearly, the problem of alienation from nature precedes capitalism. To locate the origins of alienation from nature and appreciate its world-historic significance for human emancipation, it is helpful to recall key elements of Marx’s and Engels’ historical materialism that I cited in Section 3 above. Marx and Engels argued that as they engaged in organized production for the first time in history early farmers began to distinguish themselves from other animals. What they produced and how they produced it also contributed to who the early farmers became. Modern anthropology and archeology confirm this view expressed over a century and half earlier. “...[M]ost foragers are characterized by ‘animistic’ or (less commonly) ‘totemic’ belief systems. In the former, non-human animals are not just like humans, they are persons. Their environment is a treasure house of ‘personage’, each with language, reason, intellect, moral conscience, and knowledge, regardless of whether the outer shape is human, animal, reptile, or plant. Thus the Jivaro people of eastern Ecuador and Peru consider humans, animals, and plant as ‘persons’ (aents), linked by blood ties and common ancestry (Descola, 1996). Foragers with animistic belief systems commonly do not have words for distinguishing between people, animals, and plants as separate categories, using instead classification systems based on terms of equality rather than the hierarchies of our own Linnaean taxonomies (Howell, 1996). The totemic systems of Australian Aborigines are ceremonies and rituals that stress an abstract linear continuity between the human and non-human communities. Animals are the most common totems, signifying a person’s or group’s identity or distinctiveness, but though they may be good to eat or food for thought, they are not considered social partners as in the animistic belief systems. “The forager world is animated with moral, mystical, and mythical significance (Carmichael et al., 1994). It is constructed and reconstructed through the telling of myths, which commonly include all kinds of animals as humans, changing shape between one and the other. In addition to the present world inhabited by humans and non-human-beings, there is a supernatural world. In many forager societies, shamans mediate between the lived and supernatural worlds, entering and conceptualizing the latter, commonly through ecstatic experiences... As the whole world is self, killing a plant or animal is not murder but transformation. Finding food is taken for granted, reinforced by myths telling the hunter to be the animal before presuming to kill and eat it. ‘They are being heard by a sentient conscious universe--a gallery of intelligent beings who, if offended by injudicious words (ridicule, bragging, undue familiarity, profanity, etc.) can take reprisal, usually by a steadfast refusal to be taken as food or by inflicting disease or doing other violence’ (C.L. Martin, 1993, p. 14).” (Barker, 2006, p. 59). I call foragers worldviews ecocentric because their frame of reference is their natural setting. It should be easy to agree that our ecocentric hunter-gatherer ancestors had no dualist view of the natural world in the sense Moore is concerned with. However, as Marx and Engels suggested to us and modern anthropology and archeology has documented it the perception of humanity rising above the natural world , which we may call anthropocentrism, originated with the Agricultural Revolution some 10,000 years ago. Anthropocentrism (human-centered worldview), also known as homo-centrism, human supremacism, and speciesism, is the view that holds human beings as the central or most significant species on Earth in the sense that they are considered to have a moral standing above other beings. Current consensus is that anthropocentrism perhaps contributed to the transition to farming. But there is little doubt that it emerged and consolidated with the Agricultural Revolution and institutionalized by the class societies that followed. Let's recall that farming presupposes domestication of some plants and animals. While early domestications were coincidental (how some wolves began to track humans for leftovers from hunting and in return provided the hunter-gather bands with advance warning and some protection), when farming finally consolidated it has been characterized throughout history with systematic attempts to dominate and control nature including by breeding “desirable” plants and animals and control or elimination of “undesirable” species and more recently by attempts to control against natural cycles. These contributed to the development of science and technology and it was served in turn by them. An advantage of this theory of metabolic rift and dualism is that it includes the added dimnesion of an environmental ethics not integral to Moore’s theory or those of Ecological Marxists. This environmental ethic squarely is based on Darwin’s theory of evolution and science of ecology that are both ecocentric (even though Darwin himself like others of his time was anthropocentric). The solution to the anthropocentric industrial capitalist crisis is an ecocentric ecological socialist revolution in which we retreat from more than 10,000 years of trying to dominate and control nature only to create more devastating social and natural crises. The challenge of our time is to make such a revolution before the systemic crisis undermine life-support systems of the biosphere. Dedication: The writing of this essay was delayed for months when my beloved companion Lulu (the cat) was battling serious and eventually terminal illness. He died at 5 in the morning of February 13, 2016. The Humane Society in Sonoma County, California, where I live, offers material incentives to people who adopt black cats because of the superstition that black cats are evil or at least bring bad luck. My experience has been the exact opposite. I have been fortunate to have had two companion black cats both far sweeter than all but a handful of humans I have come to know in my long life. This essay is dedicated to the loving memory of Lulu. Brenner, Robert. The Origins of Capitalist Development:A Critique of Neo-SmithianMarxism. New Left Review, no. 104: 25-92. 1977. 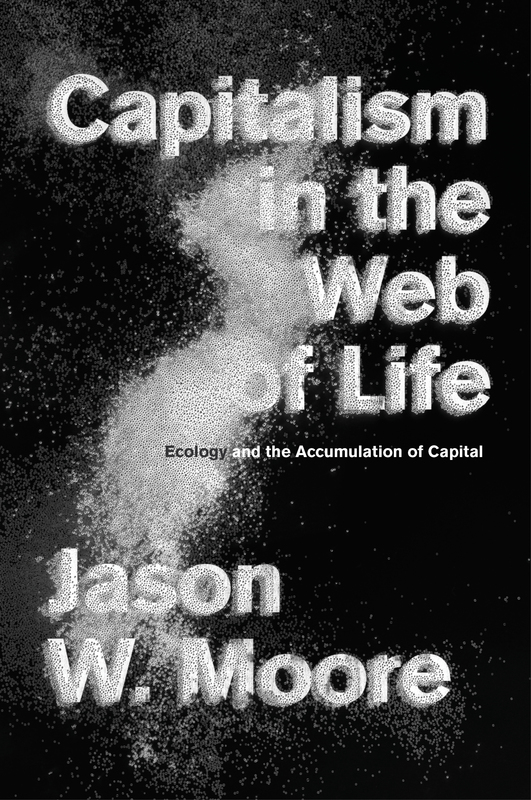 Moore, Jason W. Capitalism in the Web of Life: Ecology and the Accumulation of Capital. 2015. ————————. “An Ecological Socialist's Reflection on Edward O. Wilson's Sociobiology.” Our Place in the World: A Journal of Ecosocialism. October 16, 2015. Watson, Judith, Ted Benton, Kathryn Dean, Pat Devine, Jane Hindley, Richard Kuper, Gordon Peters, Graham Sharp & Peter Dickens (2016) “Disentangling Capital’s Web,” Capitalism Nature Socialism, 27:2, 103-121, DOI: 10.1080/10455752.2016.1178952. Wood, Ellen Meiksins. The Origin of Capitalism: A Longer View. 1999. 1. The American Sociological Association has granted Capitalism in the Web of Life the Section on the Political Economy of the World-System Book Award. Still, I found reading “Capitalism in the Web of Life” challenging. It is poorly edited and rife with repetitions. Moore liberally uses a language whose terminology is not properly explained (for example, “bundles” is first defined on page 46 but used earlier a number of times). The editorial group of Capitalism Nature Socialism in Britain similarly found it hard to summarize and understand Capitalism in the Web of Life (Watson, et. al., 2016). 2. Moore borrows this idea from George Caffenztis (In Letters of Blood and Fire, 2013): ”My use of work/energy extends it to capitalism’s unified logic of appropriation of human and extra-human ‘work’ that is transformed into value.” (p. 14, footnote 24). 3. Of course, the idea of metabolic rift originated with Marx; Foster should be credited for reintroducing it and expanding on it with others in the current surge of interest in ecological socialism. 4. Due to concern for brevity I have set aside a number of important methodological issues, including the meaning and uses of “dialectics.” “Rift” is a break from an existing pattern of relations setting up a new relationship. Once established, the new pattern of relations changes over time making for another rift, setting up new relationships. Thus, a rift happens as quantitative changes resulting in a qualitative change, or thesis and anti-thesis making for a new synthesis. This is the sense I understand Moore’s emphasis on “rift” as “shift” and Foster’s use of “rift irreparable.” Moore emphasizes continuity while Foster emphasizes change. 6. Clearly, in retrospect Marx and Engels must have said, instead of “distinguish themselves from animals,” “distinguished themselves from other animals.” I will get back to this distinction in Section 5. 7. Brenner (1977) deftly criticizes this notion. Also, see, Denemark and Thomas (1988) and Ashton and Philpin (1985). There is a renewed interest in the problem of origins of capitalism and the debate on transition from feudalism to capitalism. Writing in the same vein as Brenner, Wood (1999) criticizes the literature for its logical circularity. While Brenner’s thesis is largely accepted among economic historians and others interested in the question of origins of capitalism, in recent years a number of writers have contributed views that are different from or critical of Brenner’s, including Anievas and Nisancioglu (2015), Banaji (2014), Blaut (1994), Harootunian (2015) and Heller (2011). Others, such as Post who writes in the Brenner tradition (Post, 2012), have argued in his defense (2014). As Post observes there is nothing less than the status of Marx’s and Engels’ historical materialism that is at stake. 9. Ultimately, all species live off energy that arrives on Earth via sunshine. Through photosynthesis green plants (primary producers) convert solar energy into sugars. They consume about half of it for their own livelihood. What remains is called Net Primary Productivity (NPP). The NPP is the basis for all animal life. Herbivores eat plants to gain energy for their livelihood (primary consumers). Finally, some carnivores live off herbivores (secondary consumers). Some omnivores eat secondary consumers (tertiary consumers). The final link in the food chain is the decomposers that live off the organic matter of plants, herbivores and carnivores. In each step in the food chain about 90% of the energy is lost. Years ago, I taught Capital, as well as course on Science and Capitalism. But now, 149 years after the publication of Capital, vol. 1, I conclude that arguing over exactly what Marx meant is just not very relevant to finding workable answers to today's overwhelming problems. The implicit idea that Marxism is a theory of everything is excessive, and one of the ways that is so, in my opinion, is the attempt to tie it in with ecology. In fact, as Marx made clear in his own his own subtitles, Marxism was a critique, not even necessarily any sort of blueprint. It is still of some value as a critique, but Marx fetishism taken too far is simply a dead end. The connection between Marxism and environmentalism seems tenuous at best. To the extent socialism was visualized by Marx, why couldn't it have included unsound ecological practices, as seen from current viewpoints? Not that it necessarily would be attractive, but an ecological capitalism is also not impossible to envisage. Thank you for posting you views. I am just puzzled by it because it does not address anything specific in the essay itself and poses a number of claims that are hard to understand and remain unsubstantiated. In today's world when capitalism is by all accounts, including its main spokepersons, in crisis, you claim "what Marx meant is just not very relevant to finding workable answers to today's overwhelming problems." But recent polls indicate younger people think the exact opposite of you: more of them view socialism more favorably than capitalism. Didn't Senator Sanders run in the primaries as a socialis, receiving 13 million votes and an energetic young following? As you say, Marx offered a radical critique of capitalism. I would add: his critique of capitalism is still the best there is and his vision for socialism directly flows from it. Radicalizing youth would do well to turn to Marx. You write: "The connection between Marxism and environmentalism seems tenuous at best." I have long parted ways with the label "Marxism" as it is a mixed bag of interpretation often at odds with what Marx actually said and di (Think about Stalinism, Maoism Pol Pot, etc.) But have you read Burkett's "Marx and Nature" (1999) and Foster's "Marx's Ecoogy" (2000) discussed in my essay and still claim that Marx has little to say capitalism and ecology? You write: "The implicit idea that Marxism is a theory of everything is excessive." But who made such a claim? I never have. Moore explicitly opposes "theories of everyhting" in his book. Foster and Burkett cannot be labled as dogmatics thinkers who claim "Marxism" is a theory of everyhting. They frutifully have applied dialectics and materialism to the systemic crisis of society and nature. Is that wrong? Finally, while maitaining that "[t]he conncetion between Marxism and environmentalism seems teneous" you write: "an ecological capitalism is also not impossible to envisage." Really? Can you suggest just one authortative study that shows this possiblity? The current that claims the same and comes to mind is the Breakthrough Insitute exposing "ecomodernism"-but have your read criticism of them? Two studies by Ted Trainer appear on OPITW that painstakingly refute ecomosdernist claims. The fact remains that "Actually Existing Capitalism"--the fossil fuel-based industrial capitalism--is responsible for the Anthropocene which threatens humanity and much of life on Earth. What is your response to this existential crisis? I hope my critical reponse urges you to explain your views in detail in an essay for Our Place in the World so a serious discussion of them can enlighten everyone. I have a couple of comments on Kamren Nayeri's excellent critique of ‘Capitalism in the Web of Life’ by Jason W Moore. First, I think Kamren repeatedly makes a theoretical mistake. He says that Marx says " First farmers “begin to distinguish themselves from animals as soon as they begin to produce their means of subsistence, a step which is conditioned by their physical organization…”. In other words, labour and production do not begin with the rise of agriculture at the beginning of class society, roughly 10 or 12 thousand years ago. Labour and Production are fundamental to the nature of the human species. Human beings are part of nature, but distinguish themselves from the rest of nature by producing their means of subsistence. Engels, Marx's collaborator, wrote a pamphlet called "The Role of Labour in the Transition from Ape to Man". [ I have BTW done this as a charade - I don't necessarily advise anyone else trying it ! ]. In other words, Labour, ie the production of our means of subsistence, is not only fundamental to our "species-being", it played a key role in our evolution as a species. This dates the key role of Labour as the mediating factor between humans and the rest of nature to somewhere between the origin of the homo line 2.8 million years ago and the origin of home sapiens 200,000 years ago. Secondly, Kamren does not mention the main political problem with moving away from the Labour Theory of Value to something based on energy, the four cheaps, and extra-economic processes. This is the question of agency. Which group of humans has (i) no interest in the ongoing destruction of the environment by capitalism and (ii) the objective power within capitalism to radically transform the system ? If you believe that capitalism is a system driven by something other than the extraction of labour power from wage workers, then your theoretical analysis will push you away from looking to the working class as the main agent of social and environmental change. The first criticism appears to be based on a number of misunderstanding on your part. First, you take "labor" and "production" to mean the same thing dating them as far back as 2.8 million years ago. Engels in "The Part played by Labour in the Transition from Ape to Man" (your title in inaccurate) clearly is discussing how the ability of early humans to stand on their two legs freed their hands to do things and working with their hands helped develop them apart other Great Apes. Engels is not arguing that humans engaged in production going back 2.8 million years (In fact, the time horizon he considers given the state of knowledge at the time is "[m]any hundreds of thousands of years ago"). Second: What did humans do with their hands until the dawn of farming? Barker, an eminent archeologist begins his book "The Agricultural Revolution in Prehistory: Why Did Foragers Become Farmers?" (2006, p.1) thus: "Humans have occupied our planet for several million years, but for almost all of that period they have lived as foragers, by various combinations of gathering, collecting, scavenging, fishing, and hunting." It is important to note that currently most experts agree that transition to farming was not a choice but a compulsion and that early farmers were worse off for an extended period of time. Thus, the transition to farming marks a truly world-historic event which has been the subject of much debate for more than a century. Therefore, my interpretation of Marx' and Engels' text in German Ideology about "production" which you quote is accurate both in terms of what the authors meant and what we now know about the transition itself. My quoting of M&E in the essay is for two purposes. First, to delineate some key elements of historical materialism to show how Moore's methodology differs from them. Second, to argue for my own claim that the origin of alienation from nature is in the Agricultural Revolution. Given the limited scope of my essay, I asked anyone interested to read my "Economics, Socialism, and Ecology: A Critical Outlines, Part 2" (2013) for an exposition. Your criticism does not show that you read that longer discussion. I urge you to do so and comment if you find it wanting. Your second critical comment is about the role of agency in Marx's theory--the proletariat. You are absolutely correct that Moore's theory systematically sidelines wage-workers' significance for the capitalist economy (I say as much in the essay but in passing). But as I noted in the essay, there are a number of other important issues in "Capitalism in the Web of Life" that I had to set aside in order to assess its overall method and theory without making it too long. I have just got back from a week's holiday. I have read Martin Empson's review of your article and your comments above. I think we agree on most things, so any disagreement is interesting but relatively fine detail. I will read your article and reply as soon as I can.